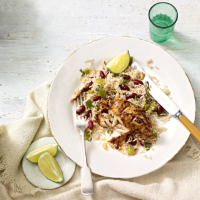 Jerk marinade, allspice, coconut... these are the flavours that capture the essence of the Caribbean and make this the perfect dish for sunny days. The recipe also works really well with salmon fillets in place of the chicken thighs. 1. Remove the skin from the chicken thighs and slash the flesh deeply. Rub the marinade into the chicken, cover and chill for 30–60 minutes. Wash your hands, all utensils and surfaces thoroughly after handling chicken. 2. Preheat the oven to 200ºC, gas mark 6. Place the chicken in a small roasting tin and cook for 30 minutes until completely cooked through with no pink meat. 3. Meanwhile, place the rice, garlic, salad onions, thyme and allspice in a large saucepan with the coconut milk and 200ml water. Bring to the boil and simmer gently for 5 minutes then stir in the kidney beans and cook for a further 5–7 minutes until the rice is tender and the liquid has been absorbed. 4. Fluff up the rice, scatter over the reserved thyme leaves and serve with the jerk chicken and a slice of lime to squeeze over if you wish. Enjoy this as a barbecue dish by making the chicken up to the end of step 2, then finishing on a hot barbecue for 2 minutes each side to add a smoky flavour.